Eagle cans are constructed of 24-gauge hot dipped galvanized steel, are the only deep drawn seamless can made, have a double interlock no-weld bottom seam, a baked on powder coat finish with a trilingual label, have a spring closing lid with neoprene gasket that vents at 5 psi internal pressure, have a non-sparking flame arrestor and pour spout, and are 100 percent made in the USA. 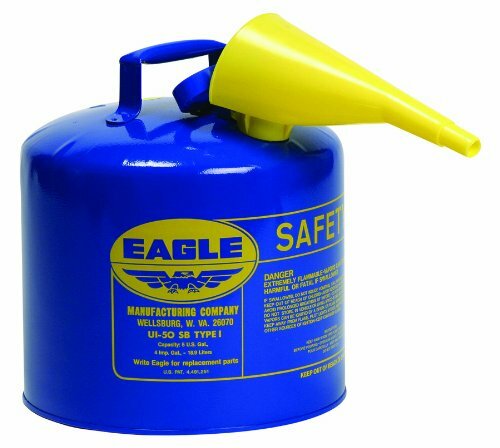 Eagle Manufacturing Company's 5 gallon Type I blue safety can (UI50FSB) with F-15 Funnel meets OSHA and NFPA Code 30 requirements and are UL and ULC listed and FM approved for safe handling and storage of kerosene. (Accepted Under CARB).